We sat down with Nick Alter, Principal and Founder of Alter Endeavors (A local Digital Marketing Agency), about how using Cynergy Data Texas has helped him grow his business. We’re proud here at Cynergy Data Texas to see Alter Endeavors’ growth over the last few years, as well as their exciting future. This entry was posted in General on February 1, 2016 by Christopher Jennings. Three Ways Accepting Credit Cards Can Grow your Business! The majority of your customers use debit cards or credit cards. According to a Gallup survey in 2014, only 30% of Americans do not have a credit card or debit card. More so, over 1/3 of Americans have three or more credit cards. For a business, by not accepting credit cards you are potentially alienating 70% of your customers. To put the percentage into concrete numbers: there are over 150 million Americans who own a credit card. By accepting credit cards and having merchant services for your business, you will be ready to serve more customers. Credit cards also allow the customer more spending power without having to carry around large amounts of cash- which means your business can accept large purchases! According to a study by American Express, American Express customers alone spend 43% more than the average cash consumer. As a business, you no longer have to rely on your customers to balance their checkbooks to ensure that the checks do not bounce. Credit card transactions can be processed instantly ensuring when a transaction declines that your business is not losing money. When accepting checks, your business could be waiting days for the check to cash and deposit into your business’s bank account. Credit card transactions start the moment the customer swipes their credit or debit card. With merchant services, your business operates more efficiently- lowering operational costs and time spent. 3) E-Commerce can make your business money while you sleep! Establishing an e-commerce system allows your business to sell products and services through your website. Customers can make transactions at any time- day or night. This allows your business to service customers on a global scale, with the security that your business will be compensated. E-commerce solutions can be easy to establish and run automated- allowing you to focus on the business and what makes you successful. Recent projections from Forrester Research estimate that Americans will spend over 350 billion dollars online in 2016. A well functioning e-commerce system allows your business to reach those customers without effort. Accepting credit cards ins’t just about “keeping up with the Jones’s” but rather can have a tangible effect on your business’s growth and increase your ROI. At Cynergy Data Texas, we can help your business reach over 150 million Americans who own a credit or debit card. We can help your company with merchant services, next day funding and establishing e-commerce systems. This entry was posted in General on January 22, 2016 by Christopher Jennings. While this may seem like a no brainer, the majority of credit card fraud comes from stolen credit cards- either the number or the physical card. If you go to a restaurant and use your credit card, always make sure you leave with your credit card. After the card is run, it can be very easy to leave your card on site (especially if you are in a hurry). Unfortunately, diligence does not always prevent your card from being stolen. Make sure to carry a light wallet, preferably in your front pocket. If you prefer to keep your wallet in your back pocket, make sure your wallet is secure. For those who carry their wallet in a purse, make sure your purse is adequately zipped. And of course- carry only the cards you will need that day. A safe rule of thumb for using the internet- if you didn’t need a password to access wi-fi, then neither do those with nefarious intentions. Unless a network or website is secure, do not use your credit card. Open wi-fi networks are easier for hackers to intercept transactions and gather the necessary information to use your credit card. These are called “man in the middle” ploys and they are far more common than one would imagine. 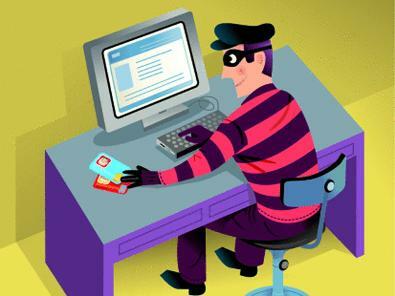 Do not pay your bills online using a credit card on an insecure network or check your credit card statements. If you prefer to online shop (which most do), it is far safer to shop from your own home on a password protected wi-fi connection. Online bill pay can be an efficient and simple way to pay your bills. Make sure you are not paying your bills with a credit card on an public wi-fi connection. In general, it is safer to have an automatic draft set up with a card than to pay it month to month online. Often times, credit card fraud can go undetected. The easiest way to ensure your card is not being used fraudulently is to save your receipts and compare your receipts to your monthly credit card statements. If you see any unusual charges, do not wait. Contact your credit card company immediately. After comparing, shred all of your statements. It is not beneath those trying to steal credit card or identity information to dig through the trash. In summary, using these three tips will not entirely prevent the possibility of fraud, but will greatly limit the access that those attempting fraud have to your information. Don’t let yourself be one of a quarter million who will have their credit card information stolen in 2016. This entry was posted in General on December 31, 2015 by Christopher Jennings. More and more, the standard cash register is becoming archaic in business. The user experience has advanced for the consumer and as a result, mobile credit card processing has become more and more common. According to the AT&T Small Business Poll in 2013, 30% of businesses have already adapted and implemented mobile payment terminals into their own business. By definition, mobile payment terminals allow you, the business, to accept credit cards on a smart phone, tablet or lap top without the need to plug in. These terminals are complaint with federal/state regulations and can allow your business to do business anywhere in the world. Examples we have seen of mobile pay already include: roofing businesses, tow trucks, restaurants, home cleaning services- just to name a few. With mobile pay solutions, your employees can become a payment terminal. Waiters, contractors, managers can all process credit cards without being confined to a POS cash register or terminal. Your business becomes mobile, at any time. The most common form of usage has been mobile phone payment terminals. There are a plethora of apps available for download that turn your phone into a business terminal. However there can be a danger associated with some of these apps. At Cynergy Data Texas Texas, we have researched these apps and can guide you through which one to choose that will again save you the most money. One example is Vwalaa! Mobile Pay. Vwalaa! comes with a compact card reader that can plug into the audio jack of your mobile phone and accepts all major credit card companies. While paying through a mobile pay terminal might sound strange, mobile pay is the future of credit card processing. According to a study done by Visa in Europe, by 2020 over 50% of transactions will done with a mobile credit card terminal. Even more so, PRWeb estimates that over $275B will be processed using mobile payment systems by 2018. At Cynergy Data Texas, we see the future coming in credit card processing. We are the experts on mobile payment solutions and we offer many solutions that can help your business be a part of the over $275B that will be spent by consumers through a mobile terminal in the future. We believe that there will be tremendous growth that results from letting businesses become mobile rather than tied to a POS register. Turn your employees into a POS system by contacting us today about Mobile Pay! This entry was posted in General on November 4, 2015 by Christopher Jennings. Giving back to the community is something that many businesses espouse and aspire to do. In our globally connected economy, consumers are increasingly educated and conscious about the power behind their purchases. When choosing where to spend their dollars, consumers may take into account the charitable actions of the company they are patronizing. We want to help you and your business offer your community and world a way to participate in giving back to your local area. You don’t have to be a big company to make a big difference, with DonateWiseNow you can help local people support causes in your community. DonateWiseNow is exclusive to CynergyData Texas. This micro-donation point-of-sale solution can help your business build stronger ties with the community. DonateWiseNow can be integrated into your point of sale software. Every time a customer makes a purchase, they will be asked if they would like to donate a small amount ($1 or $2) to a charity or round their purchase up to next dollar amount. Through incorporating DonateWiseNow into your payment options, you are educating customers about your philanthropic initiatives and inviting other community members to help you give back. Through one simple transaction your client base knows more about the heart of your business and your efforts to make a difference in your neighborhood. Your sales employees will not be required to solicit donations, but may be able to answer further questions a customer might have about your community involvement. You don’t have to limit your altruistic actions to your neighborhood or one organization. You can select up to nine different charities to support through DonateWiseNow. These charities don’t have to be local, they can also be national. You can change or add the charities which will be vetted and signed for by CynergyData Texas. CynergyData Texas is opening the doors for smaller retailers and businesses to host their own community initiatives by helping to facilitate fundraising. DonateWiseNow is an incredible turnkey donations program that offers your business a way to accept donations and give back to your community. This entry was posted in General on July 30, 2014 by Christopher Jennings. You’re standing in the ten items or less line at the grocery store, how would you prefer for the person in front of you to pay? D. Doesn’t matter, just so long as they are quick. Credit and debit cards expedite the payment process and help everyone get on their way much quicker. As fewer and fewer people carry a check book or cash, you might find it harder to do business with people if you don’t accept plastic. CynergyData Texas has a variety of programs suitable for smaller businesses who may need help accepting cards in some more unusual situations. In a town like Austin with tons of outdoor festivals, music events and no lack of passionate or creative small business owners, don’t let the inability to accept plastic keep you from making sales. We know that not every transaction takes place indoors. We offer wireless and mobile solutions for small business owners who are out there pursuing their passions and building their businesses in nonconventional settings. From musicians selling t-shirts to food trucks plying their latest creations to a non-profit hosting an outdoor fundraiser, you’re never too small to accept credit cards. Please let us help take care of you by setting you up with your own merchant account. This entry was posted in General on July 28, 2014 by Christopher Jennings.